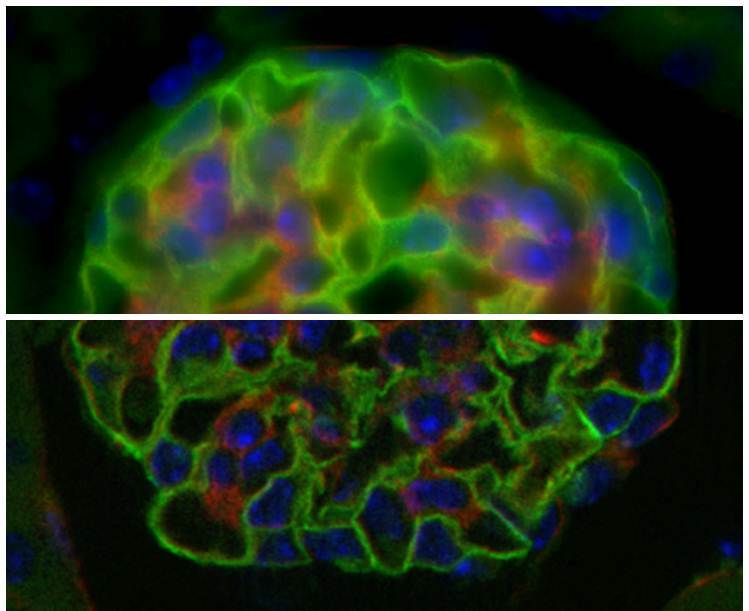 Confocal microscopy has become an essential tool for life sciences researchers. The confocal’s ability to optically slice through thicker specimens, excluding the out-of-focus light while imaging just the focal plane, makes it the technique of choice for high-resolution fluorescence microscopy. But with several different kinds of confocal microscope available, which one should you choose for your experiment? Let’s look at three different kinds of confocal microscope, with a particular emphasis on how well they perform optical sectioning and the quality of the resulting images. The laser-scanning confocal is the “original” confocal, and can still be considered the gold standard, particularly for fixed samples. For live-cell imaging, a well-equipped spinning-disk confocal can give you fast frame rates and can be less phototoxic to the cells. Finally, if budget is a concern for you, we consider whether the grid-based optical sectioning microscope (sometimes called “structured illumination”, not to be confused, though with the superresolution techniqute of the same name) will be adequate. The classic laser-scanning confocal scans a focused laser beam back and forth across a sample, in a raster pattern. At each position, the focal point is imaged through a pinhole onto the detector – the pinhole blocks out-of-focus light from being detected. A confocal isn’t really necessary for a sample as thin as the fixed BPAE cells: when the widefield image stack is focused appropriately, the actin filaments are already sharp and well-contrasted from the background. Nevertheless, this thin sample (essentially one 1um-slice-thick, except where it bulges around the nucleus) with its sharp features helps us to see the overall quality of a single slice. As expected, the confocal excludes the out-of-focus light, so that as you move the focus away from the plane of the cells, the field rapidly becomes dark rather than blurry. The thick sample nicely shows how the laser-scanning confocal can optically section a specimen into many slices, easily going as deep as 50um (and for many biological samples up to 100um or deeper, depending on the density of the labeling). The laser-scanning confocal performs optical sectioning without compromising resolution: in fact, it gives you a small resolution improvement over widefield (although this is not terribly obvious, even in side-by-side images). Its main drawback is acquisition speed: to maximize the quality I used 1024 x 1024 pixels, sequential imaging of 3 channels, and averaged 4 images per slice, so for 25 slices through the kidney the image stack took about 6 minutes. A laser-scanning confocal is relatively slow, scanning a single focused spot across the sample and measuring the fluorescence intensity one pixel at a time. The spinning disk sweeps about 1000 beams of light around the sample in parallel, and images them through a disk with a thousand pinholes onto a sensitive camera. This is the spinning-disk confocal’s main advantage over it’s laser-scanning cousin: speed! However, to achieve decent speeds they are typically configured with a 512 x 512 pixel EMCCD camera, which sacrifices resolution to give you large, super sensitive pixels. … especially when you zoom in. Optical sectioning suffers for the thicker specimen: the thicker your sample, the more scattered light is generated which sneaks in through the wrong pinhole and reduces the confocality. This is why spinning disks should be used for faster live-cell imaging and are not really the right tool for fixed slides. 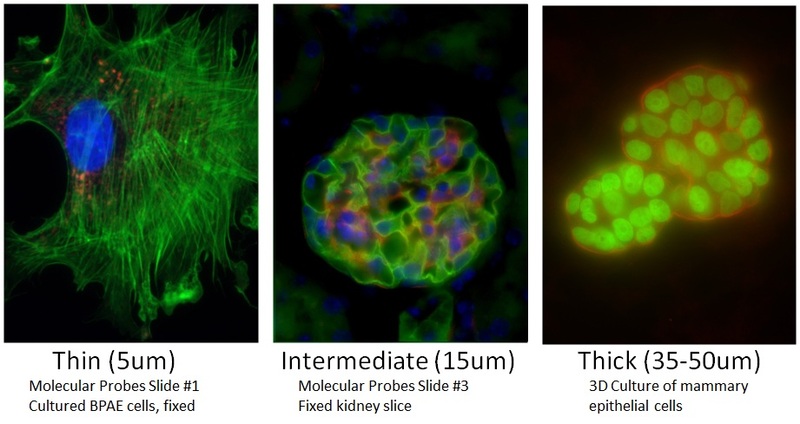 I was pleasantly surprised to discover that the Apotome could, indeed, produce confocal-like optical sectioning for the not-too-thick kidney slice: there is no doubt that much of the blur has been removed, and when you move completely out of focus the image is black. For the thicker sample, the Apotome image is very noisy (despite setting the algorithm to its maximum smoothing), and more-or-less unuseable except maybe near the surface. The reason for this is that, as the sample gets thicker, the grid pattern that is projected into the image gets obscured by the out-of-focus blur. I would say that grid-based optical sectioning is limited to samples that are at most 20um thick. My thanks to Dan Stevens of Carl Zeiss Canada for help with acquiring the Apotome images; Hui Wang of OCI for providing the 3D culture of mammary epithelial cells; and of course my team Miria, Judy, and Feng at the AOMF. This entry was posted in Confocal, Optical Sectioning and tagged confocal, optical sectioning, resolution. Bookmark the permalink.